Improve your Overwatch gameplay with one of our coaches carefully chosen from our finest boosters. You can choose specific hero you would like to learn (don't forget to put it to note in the checkout) then after you order the coaching you will be given access to our Members Area where you will talk directly to the booster about timeschedule of the boost. Coaches are very flexible. 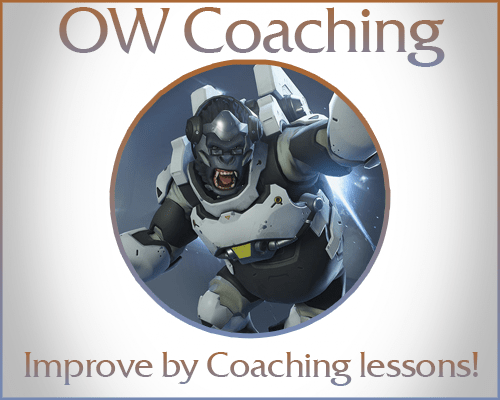 The coach can teach you while playing with you in duoqueue - positioning, principles of good gameplay and much more! Our overwatch coaching can be divided into more sessions. How can I arrange my sessions? After you buy the boost and the coach will be assigned to you - the chat between you will enable and you will arrange your sessions. On which servers is the Overwatch coaching available? The coaching is available on all servers. Is there some coach from my country? We have many coaches from different countries and timezone to ensure you won't have problems with scheduling your sessions. Currently we support only English. Overwatch is a team-based multi-player shooting game in a future setting. Developed by Blizzard Entertainment, Overwatch is a highly stylized first-person shooter. Each match is an intense showdown of diverse soldiers, adventurers, scientists, and oddities in a globe-spanning game conflict.In Overwatch, you can choose from a wide selection of heroes with different abilities. To improve your gameplay, however, you will need to learn just about everything about the heroes that you choose. While this may sound like a big challenge, there are Overwatch coaching services available to help you become the Overwatch player you’ve always wanted to be. The best thing about Overwatch is that it never really gets old. Thanks to Blizzard Entertainment’s efforts of frequently launching new updates, maps, modes, skins, and heroes, players get to enjoy new features of their favorite game time after time. Read on and learn why many are playing Overwatch. One of the best things about Overwatch is that it has a great set of characters that blend really well in one multi-player first-person shooter. There are four class types: The Offense types, Defense types, Support types, and Tanks. After choosing your class type, you will choose from a wide selection of characters, and each character boasts of unique skill and personality. With this, you can choose a character that perfectly matches your style as an Overwatch player. Another great thing about this game is that it presents game highlights in between matches. Unlike other games, Overwatch encourages players by displaying players’ successes.After every match, the game will display the positive contributions of the players. The game will also craft Highlights showing players’ best performances with a recap. There’s also the Play of the Game which honors players through post-match highlights. Unlike other games, Overwatch does not only measure a player’s abilities based on his or her kills. In this game, players get to have a lot of ways to contribute like healing, absorbing damage, or giving assists like recon or armor. These forms of contribution are only as valuable as kills, which in this game are recorded as “eliminations”. In Overwatch, characters are everything. That’s why it’s important for you to learn everything about the one that you chose. Since the characters are a significant part of the game, there is a Tutorial specially meant to help players study their characters. There is a practice range with robots as well as matches against computer-controlled opponents. You can engage in these extras to develop your character’s skills and learn about it at the same time. Each character owns a weapon with unique abilities and two powers that recharge after each use. Characters also have Ultimate abilities – special abilities that can turn the tides of a match. All the mentioned abilities can be enhanced through the practice options. However, if you’re still having a hard time learning on your own, you can get an Overwatch coach to guide you. An Overwatch coach can help you learn more about your character so that you can use it at its top shape. Overwatch coaching can also be helpful if you want to learn new strategies for playing the game. Overwatch really gives you a long list of reasons why it’s a game that’s worth playing. With its features, it attracts players and keeps those who are already playing impressed with more and more updates. Best of all, it gives players the opportunity to team up and play with teamwork. Why try Overwatch coaching? The answer is simple. Try Overwatch coaching because you need it. As said, characters pretty much play an important role in the game. For this reason, it’s important to master everything about your chosen character. This way, you can enhance your Overwatch gameplay to the highest level. At ProBoosting, Overwatch coaching is easily available. You simply choose an Overwatch coach, set a time schedule, and attend the coaching session. Of course, you can avail of more schedules if you deem it’s necessary. Our Overwatch coaches are not only highly knowledgeable and skilled but are also friendly and professional. They are experienced and are considered to be experts in the game, which is why they have become Overwatch coaches. With our Overwatch coaching services, we give you the opportunity to boost your gaming experience at an affordable price. We make sure that you’ll get your money’s worth by giving you high-quality services. We take the standard safety measure to ensure your transaction’s security. This is one of our top priorities. We care about our customers bigtime. That’s why we give our 100% when it comes to customer care. We want to satisfy your gaming needs as much as possible. We give you safe banking options, and you can choose the one that suits you best. We do this to keep you and your money safe.At ProBoosting we value your love for gaming. Hence, we try hard to ensure you get the best from your gaming experience with our high-quality game boosting and coaching services.